If you don't mind paying a little extra, take a close look at Arcteryx's innovative and now-updated 'Warp' Technology R320A climbing harness. The original R320 collected a gaggle of awards, including Popular Science Magazine's 'Best of What's New 2007', for its innovative 'Warp Strength' design, which spreads the harness fabric's longitudinal fibers (removing the vertical ones altogether) and holds them in place with 11 layers of glue. What that means in practice is that the R320's straps feel more like struts than cords, creating a firm, flat platform to bear your weight rather than biting into your flesh. The 320A expands on this design by adding a tad more width to the load-bearing straps, creating even more surface area to distribute weight for even better in-the-field comfort. If you want an ultralight harness (11.4 ounces, men's small, measured) that's still suitable for extended rappels or otherwise hanging around, the R320 is really without peers. To truly appreciate the R320A, it's best to buckle in to one and try hanging in it. 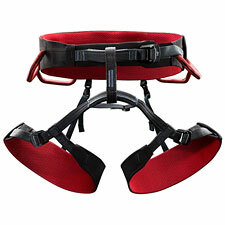 The R320A is not just acceptable here—it outshines many heavily padded sport climbing harness. Best of all, the R320A has a remarkably slim profile. It is not bulky, intrusive, or likely to snag. Wearing this sleek, light design, you may not even notice it's there. Climbers who frequent off-width cracks and chimneys will rave about it. Despite its low weight, the R320's feature set is not Spartan. You get four asymmetrical, reversible gear loops (to hang gear in the direction you prefer). There is a haul loop on the back, and a welcome belay loop on the front, which has been reinforced in the updated 'A' version to add strength. Leg loops are "warped" for comfort. While adjustible, note that these do not have quick release buckles, which remains a potential issue for winter mountaineers. On the comfort front, be aware that the 'Warp' concept results in flatter, stiffer support straps with relatively hard edges. While there is no question this makes the harness comfortable for supporting your weight, if you climb in hot weather or otherwise aren't wearing a lot of clothing between yourself and the harness straps, the harness fabric does not breathe at all, and the waist belt's edges can start to bite into bare skin. The R320A has a self-locking buckle, to eliminate the dire possibility of forgetting to double-back the loop. A discretely-placed loop keeps the waist strap's loose end stowed nice and tidy while you're climbing. Given how thin the harness is, you may have questions about durability. Arcteryx has used high-end Schoeller™ Dynamic fabric to cover potential wear zones, adding considerable protection against abrasion damage. Additionally, orange wear indicators are sewn-in throughout to let you know when it's time to retire the harness. Recommended!